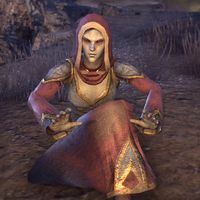 Acolyte Madrana is a Dunmer priestess found in the encampment outside the city of Ebonheart. "The Three keep you, traveler. Are... are you willing to risk heresy to save the soul of Ebonheart?" Heresy? What are you talking about? "The disciple of our Tribunal Temple has lost his faith. He says the Three no longer speak to him. He sent me to pray for him at the shrines to Almalexia, Vivec, and Sotha Sil just outside town. But I was driven away by a foul smell and angry alit." What kind of smell? Why were the beasts so angry? "I don't know. The smell may have driven the beasts into a frenzy. Perhaps, if you'd be willing... would you burn these flowers at each shrine? If the Three respond, tell Disciple Sildras. Perhaps that will restore his faith." "I'll pray for an answer to your voice at the shrines. Praying for prayers! Perhaps Vivec will appreciate how circular that is." You said heresy. Have you upset the Three? "I don't know why Sildras thinks the Three would abandon us. We have observed all the proper rites. These flowers, for one—"Roland's Tears", the rarest of the golden kanet and sacred to the Three. It is a powerful offering." This page was last modified on 28 February 2019, at 20:37.